All remaining MARRIAGE & DEATH NOTICES has been reduced from $35. to $25. !!! Observer is among North Carolinas most useful post-Civil War newspapers. The newspaper was re-established by the Hale family in 1883.
also came from Tennessee, Alabama, Mississippi, Florida, Texas, Georgia and others. This 8.5" X 11" soft cover publication contains a surname index of almost 14,000 names. Front: Sardis is a beautifully maintained old cemetery hidden among the trees about a mile off Highway #401 South near Fayetteville, NC. Here the fragrant Magnolias proudly represent the Old South making this a truly peaceful resting place for many. 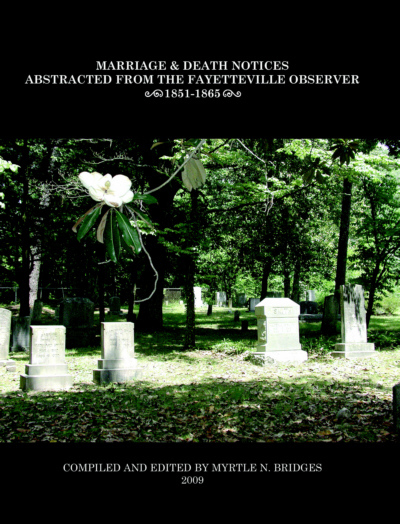 In order to keep the cost of this publication affordable, I have posted the huge number of Confederate Soldiers who died in the Civil War (1861-1865) here.